I am publishing a couple of days early and will be skipping a week. But, I will be posting again on Nov. 15, 2015. 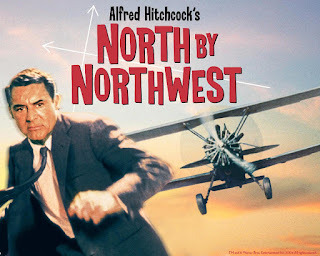 The title of this Alfred Hitchcock directed movie is ironic, pointing to a specific direction, considering all of the misdirection that occurs in the story. This film is primarily about pretending. The main character is Roger Thornhill (Cary Grant), who, like Don Draper, is in advertising, and thus a professional in disguising the whole truth. He becomes immersed, possibly as a form of divine retribution, in a situation rich with deception. And deception can lead to danger which is implied by the opening credits which have the names sliding down the side of a building (a foreshadowing of the last scenes on Mt. 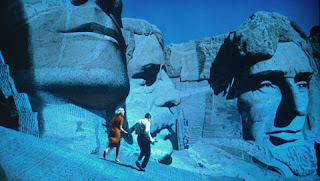 Rushmore?). A hotel pageboy calls for someone named George Kaplan at the same time Roger flags him down about sending a telegraph. He is mistaken for Kaplan, and is kidnapped by some thugs. He is taken from Manhattan to the Long Island estate belonging to Lester Townsend. Roger is locked in the library and is confronted by “Townsend” (James Mason) and his secretary, Leonard (Martin Landau). He is questioned as Kaplan and despite his protestations that he is not the man, Mason’s character does not believe him. It appears that Kaplan is a secret agent on the trail of Mason’s organization. 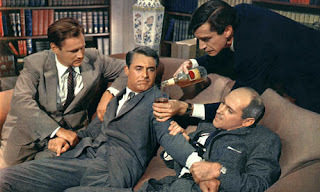 Leonard and a henchman force whiskey into Roger, causing him to be extremely intoxicated. They place him in a moving car, hoping he will die in a DUI accident. Roger thus is put onto a road literally and figuratively which he does not know where it will lead him (more misdirection). He survives and then returns with the police to the estate. They meet a woman pretending to be “Mrs. Townsend” who acts as if Roger was an old friend who came to a party there already inebriated. She implies that the stolen car in which Roger had been placed was accidentally borrowed by the drunken ad man. The library is now presented as a different room, with no liquor cabinet and no bourbon stained sofa pillows. Mrs. Townsend says that her husband is at the United Nations, where he works. The man outside appears to be a gardener, but was one of the henchman who kidnapped Roger (more pretending). Since he was drunk and in a car not his own, and the house belongs to a prominent person, the police dismiss Roger’s story. Mason’s character had told Roger the room number where Kaplan was staying at the hotel. He goes to the room and discovers that Kaplan was not seen by the maid or valet. He pretends to be Kaplan to enter the room, which of course makes it difficult to argue that he is not the man. The room appears to have been occupied since there are clothes, personal items, and a photograph that shows Mason. Roger goes to the UN to confront Townsend (again calling himself Kaplan because he concluded from the photograph that was in the hotel room that Kaplan knew Townsend) only to find that it is not Mason. The real Townsend says the house is currently unoccupied and his wife is deceased. One of the thugs, Valerian (Adam Williams), who pretended to be the gardener at the estate, throws a knife and kills Townsend, who collapses into Roger’s arms. Roger grabs the knife and pulls it out of the victim’s back. A photographer covering the General Assembly session takes a picture. Thus, it appears that Roger is the killer of a person whose house he visited earlier in a drunken state. (There is a flaw in the plot here – the local police went with Roger to the Townsend estate and saw the “wife” who is actually dead. This would lend credence to Roger’s story). Roger now becomes what is a recurring theme in Hitchcock films – the innocent man pursued for a crime he did not commit. There is then a scene with members of an American spy agency having a meeting. We learn that there is no George Kaplan, who was invented to throw off Mason, whose real name is Vandamm, from discovering the real secret agent on his trail. Roger now has augmented this charade by becoming the physical embodiment of the red herring. In a cold-blooded decision made by the spy chief, The Professor (Leo G. Carroll – yes, he becomes the head of the spy network later in the TV series The Man from U.N.C.L.E. ), it is decided to do nothing and continue to let Roger remain in danger as a way to preoccupy VanDamm and his men. 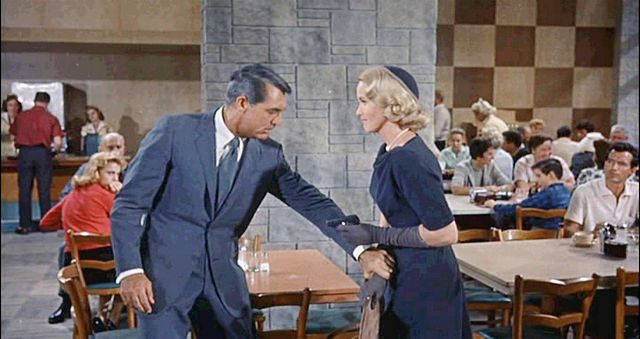 Roger, on a train to Chicago to find the fictitious Kaplan at one of the hotels mentioned by Vandamm, encounters Eve Kendall (Eva Marie Saint). 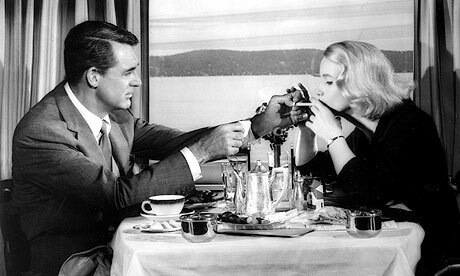 She recognizes him as the fugitive, but is obviously attracted to him and helps Roger hide out in her sleeping car. Eve is also not what she appears, as we find out when she sends a message to Vandamm who is on the train along with Leonard. The next day, Roger escapes detection by the police by dressing up as a railway porter (yes, more pretending) assisting Eve. The police discover the porter whose clothes Roger used, and Roger hides out in the men’s room, lathering up his face for a shave so he won’t be detected (more use of disguise). Eve is supposedly calling Kaplan for Roger so the two can meet, but she is actually talking to Leonard who gives her instructions as to what to do with Roger. Eve seems very upset when after telling Roger to meet Kaplan out in a rural section outside of Chicago. She abruptly leaves him. Roger is left off at a bus stop in farm country, but Kaplan is nowhere to be found (of course). A man waiting for a bus sees a crop duster plane and comments that it is dusting where there are no crops. Again, the plane is pretending (that word again) to be something else. Roger has been set up and the plane moves in for the attack. 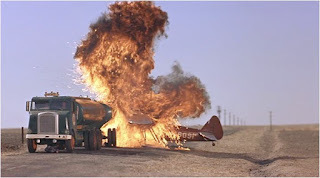 Roger again escapes, as the duster flies into a passing truck, and explodes, killing those onboard the aircraft. Roger heads back to the hotel ready to confront Eve about her double-cross, since he is told that the record showed Kaplan checked out at the time Eve was supposedly talking to him. When she sees that he is alive she embraces him, relieved, thus confusing Roger. She receives a call, writes down the address, and takes the piece of paper with her as she leaves. Roger uses a pencil to expose the address etched in the page beneath (for an advertising guy, he is quite adept at getting out of tight spots and tracking things down). 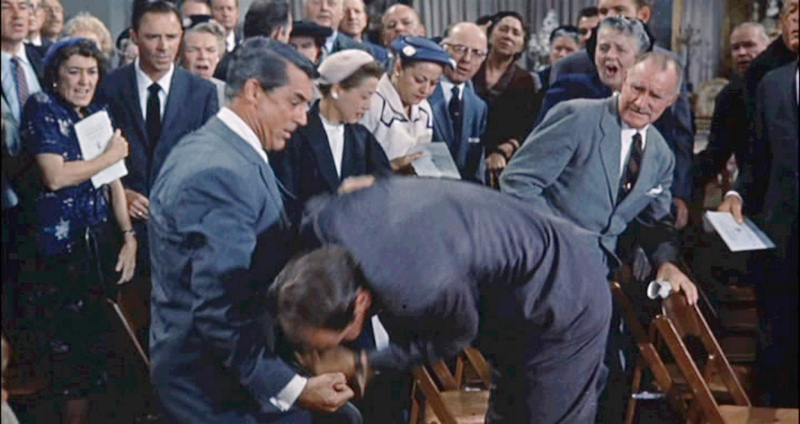 He arrives at an auction, where Vandamm is with Leonard and Eve. Vandamm is acquiring a statuette. Roger confronts them, and makes a scene so that the police will take him away from Vandamm’s thugs. The Professor is at the auction, and intervenes with the police. The spy informs Roger about the invention of Kaplan and the need for him to play along a little more by pretending to be him. The government wants to find out about Vandamm’s network which deals in stolen secrets. We now learn that, again, Eve is not what she seems. She is actually helping the spy agency by going undercover. 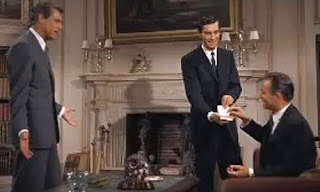 Roger is able to warn Eve by dropping his monogrammed matchbook with a message in front of her from the upstairs level of the house. 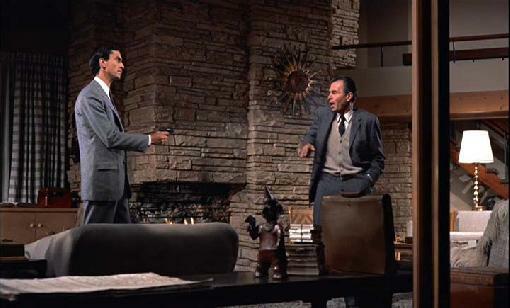 After they leave for the plane, Roger is confronted by the maid who stops him at gunpoint. It turns out she has the same gun with the blanks, which Roger recognizes, and the discharging of the blanks distracts Vandamm. Eve grabs the statuette and runs. She and Roger then try to make their escape over the face of Mt. Rushmore. Valerian pursues them, but they prevail, and the thug falls to his death. Leonard grabs the statuette in a tussle with Eve. She stumbles and Roger saves her by grabbing onto her with one hand as he hangs onto the edge. Leonard starts to grind his foot on Roger’s hand, but is shot by park rangers who are with The Professor. The statuette breaks revealing the microfilm inside (another object that is not what it appears on the surface). Vandamm is placed into custody. It first appears that Roger is trying to help Eve off of the cliff, but the scene shifts to him lifting her to the upper birth in a train as they speed off to their honeymoon, another image that is not what it seems. The use of Mt. Rushmore here is similar to what Hitchcock does with The Statue of Liberty in Saboteur. In both pictures, he depicts, ironically, violence and criminality occurring at locations that symbolize awe-inspiring morality, reminding us that sometimes we only attain a semblance of a civilized state. Another way that this film isn’t what it seems is the way it subverts the drama with a great deal of humor. Roger is incredibly cool given his circumstances, shooting off one-liners. When he is abducted by the thugs, he asks if he can call his dining partners to explain he is being kidnapped. When he is held captive in the library at the Townsend estate he says it’s good because, “I can catch up on my reading.” At the auction, he says to Vandamm, “I didn’t realize you were an art collector. I thought you just collected corpses.” There is definitely a great deal of double entendre between him and Eve. She says she can handle herself by saying, “I’m a big girl,” To which he responds, “Yeah, and in all the right places, too.” When she invites Roger to stay hidden in her room on the train, she says, “It’s going to be a long night … And I don’t particularly like the book I started.” Once they are in her compartment and he is in the upper birth where he hid he asks her why she is so nice to him. She answers by saying, “Do you want me to climb up and tell you why?” And the last image of the film is the none too subtle image of the train going into a tunnel. Oh, Hitch, you rascal, you. The next movie is 12 Angry Men.